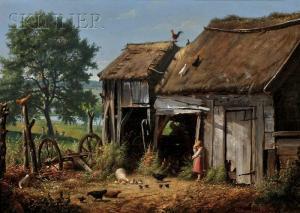 Find artworks, auction results, sale prices and pictures of Ole Peter Hansen Balling at auctions worldwide. 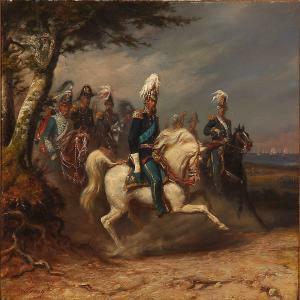 King Frederik VII of Denmark on horseback in front of his staff during the First Schleswian War. 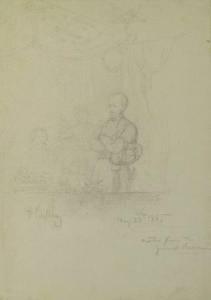 Signed and dated H. Balling Paris 1854. Oil on canvas. 33 x 40 cm. 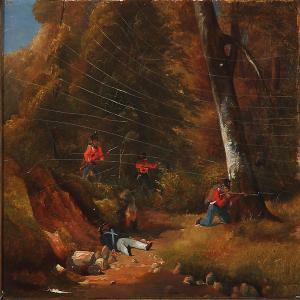 Ole Peter Hansen-Balling participated himself in the war, where he painted his rare motifs. The present painting is an example on how he finished some of them afterwards. See also online auction 1320, lot no. 85. Oil on canvas, 10 x 14 in. (25.4 x 35.6 cm), framed. Taped to mat from top verso edge - two pieces of tape. Lightlytoned. Surface dirt and some smudges. Light foxing. Crease in upperright corner. small piece of tape on bottom right corner [verso].Some wear along edges. Fighting soldier in the First Schleswian War. Unsigned. Oil on cardboard. 18 x 24 cm. Ole Peter Hansen-Balling participated in the war himself, and here he painted his rare motifs. The present unsigned painting is earlier acquired together with a painting, signed by Ole Peter Hansen-Balling, namely online auction 1320, lot no. 1.